Received this call via the Soul Of Miami. They are looking actors to participate in a cool theatre program. We are looking for male and female actors ages 15 and older for our innovative, interactive theater program. Our mission is to utilize The ARTS for social change. Participants must be 15 years of age or older with valid identification. There is no age cap on participation. All individuals under 18 must have signed parental consent. 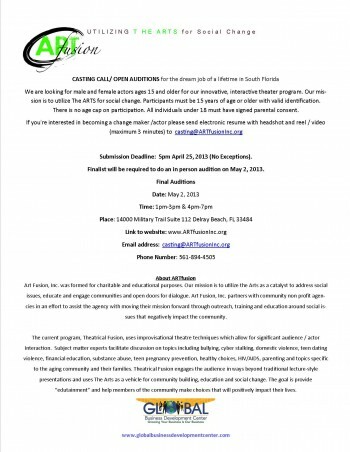 If you’re interested in becoming a change maker /actor please send electronic resume with headshot and reel / video (maximum 3 minutes) to casting@ARTfusionInc.org. Submission Deadline: 5pm April 25, 2013 (No Exceptions). Finalist will be required to do an in person audition on May 2, 2013. Art Fusion, Inc. was formed for charitable and educational purposes. Our mission is to utilize the Arts as a catalyst to address social issues, educate and engage communities and open doors for dialogue. Art Fusion, Inc. partners with community non profit agencies in an effort to assist the agency with moving their mission forward through outreach, training and education around social issues that negatively impact the community. The current program, Theatrical Fusion, uses improvisational theatre techniques which allow for significant audience / actor Interaction. Subject matter experts facilitate discussion on topics including bullying, cyber stalking, domestic violence, teen dating violence, financial education, substance abuse, teen pregnancy prevention, healthy choices, HIV/AIDS, parenting and topics specific to the aging community and their families. Theatrical Fusion engages the audience in ways beyond traditional lecture-style presentations and uses The Arts as a vehicle for community building, education and social change. The goal is provide â€œedutainmentâ€ and help members of the community make choices that will positively impact their lives.